Over the last couple of months, I have continued my journey into the Silver Age of comics with the second "year" worth of the original Uncanny X-Men series, issues 13-24. (Again, I put "year" in quotes because, for some of this period, X-Men was published on a bi-monthly basis). Below, I will briefly review the story arcs of this series. Note, however, that "story arcs" were not produced the same way in the 1960s as they are today. Back then, a main plot usually only lasted 1-2 issues, perhaps 3 for a longer plot, but inserted into the main plot were little hints and clues about upcoming stories. Therefore, "arcs" were not well-defined, stand-alone entities as they are today... so some of my divisions will be arbitrary. 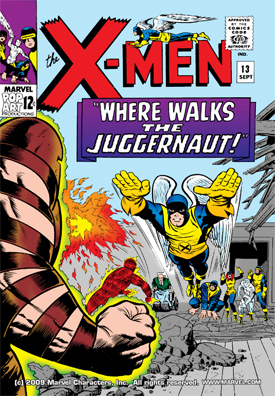 X-Men #12 had ended in a cliffhanger, with the Juggernaut ready to defeat the mutant team and kill his half-brother, Professor X. In the action-packed issue #13, the X-Men continue their battle with him, and Professor X joins the fray. 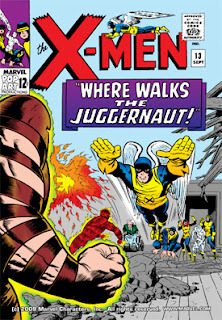 We quickly learn that Juggernaut's helmet blocks the mental powers of Professor X, so the X-men use delaying tactics to buy the professor time to construct a helmet to amplify his mind waves. Even this is not enough, however, so they call for reinforcements -- Professor X mentally summons Johnny Storm of the Fantastic Four for aid. At first, Johnny doesn't believe them, so he doesn't come right away, and the X-Men are forced to continue fighting alone. They cleverly turn the danger room against Juggernaut, which holds him at bay a little longer, and finally Johnny Storm is convinced to come help as the Human Torch. As the battle progresses, Angel manages to pull Juggernaut's helmet off, which finally gives the Professor a chance to defeat him with mental powers. When the story concludes, the X-Men are recuperating in bed while being tended to by Jean Grey. As a long-time reader of the X-Men from years back, I was, of course, well familiar with the giant Sentinel robots who are programmed to detect and destroy mutants. What I did not realize, was that these robots were created by Stan Lee and Jack Kirby back in the 1960s. 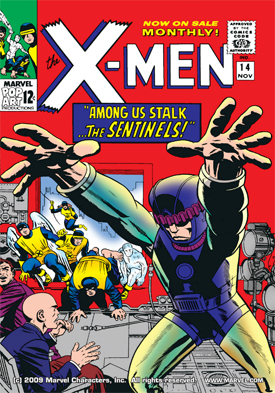 In fact, the Sentinels first appear in issues 14-16 of this original X-Men series, and they are more or less depicted back then as they have remained for many years -- giant humanoid robots who are programmed to hunt down mutants. In this next story-line, which again covers issues 14-16, we see how the Sentinels came into existence, and we also see, for the first time, the "anti-mutantism" that eventually came (decades later) to dominate the Marvel Universe. This part was somewhat hard to credit, as it happened very quickly. In the first 13 issues, when they appeared to the public, the X-Men were generally treated as heroes, if strange ones. Now, suddenly, because of the efforts of anthropologist Bolivar Trask, who announces to reporters that mutants are a threat to mankind, mutants become hated and mistrusted overnight. Professor X tries to debate Trask, but then Trask trots out his Sentinels to show that he has found a way to defend mankind -- only to lose control over them. The Sentinels, you see, think they are superior to humankind, and that the only way to "protect" us is to take over the world. Most of the Sentinels take off after capturing Trask, but one stays behind to guard the studio audience, and the X-Men arrive to take it on. Eventually the Sentinel drops inactive for no reason they can fathom, and the X-Men leave it behind to give chase to the others. Eventually, they find the Sentinels' secret base, and Beast and Ice Man wind up captured by the giant robots. The lead Sentinel, called Master Mold, then has the Beast brought to him, and starts a psycho-probe to learn the secrets of the X-Men. This provides an opportunity for us to learn the background of Hank McCoy, but before he gives up the secrets of the X-Men, Professor X shows up in "astral" form and mentally blocks the probe. Meanwhile, the other X-Men break Ice Man out of captivity, and begin fighting their way through the Sentinels' base, but they all end up captured, and the base seals itself, leaving Professor X outside. In the final issue, with the X-Men captured, Professor X returns to the studio to study the one inactive Sentinel, and realizes that a giant crystal decorating a nearby tower, visible through the window, is responsible for deactivating it. He realizes that it is interfering with control transmissions, and if they can block those, they can defeat the Sentinels for good. As the X-Men break out of their imprisonment, Professor X and the military arrive with the giant crystal, which deactivates most of the Sentinels. The Master Mold tries to force Trask to make more Sentinels, but Trask finally has a change of heart, and sacrifices himself to destroy the machine and Master Mold. As the base collapses, the X-Men escape. In issues 17-18, we are treated to the return of the original arch-enemy of the X-Men -- Magneto. 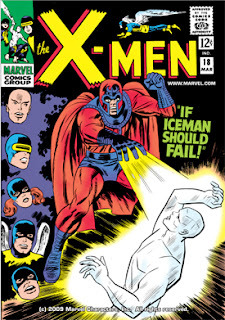 While Bobby Drake/Ice Man remains hospitalized in a coma, and the X-Men worry over him, a mystery man breaks into the mansion and prepares to turn it against the team. One by one the X-Men return, only to have their base turn itself against them and start attacking them (all except for Bobby, who remains in the hospital). The mystery man traps all the X-Men in a giant metal sphere, which he attaches to a hot-air balloon and sends into the air in a classic Silver Age "deathtrap." The villain, now revealed to be Magneto, then returns to the mansion door to greet Warren's parents, who are there visiting. As the X-Men soar ever higher in their balloon, heading toward upper-atmospheric death, Magneto uses his "magnetic attraction" vision to hypnotize Mr. and Mrs. Worthington. Because they produced one mutant already (Angel), Magneto decides to use them to clone an army of mutants. He uses his magnetic powers to assemble a machine to read and reproduce their genetic code while they sleep. Meanwhile, high above the earth, Professor X breaks out of the psionic distorter Magneto fitted onto him, and he and the X-Men try to escape. At the same time, Bobby wakes up and heads back to the mansion to stop Magneto. Finally, as Ice Man battles Magneto, the X-Men manage to deflate their balloon, and Marvel Girl uses her telekinesis to cushion the fall. Escaping the deathtrap, they enter the battle and fight against Magneto. As the battle goes against them, the Stranger who captured Magneto in the first place returns, summoned by Professor X. Magneto flees, chased by the Stranger, and the X-Men stop the mutation device before it can produce an army of evil mutants. Issue 19 is a one-shot story about a villain called Mimic, and is the final issue written by Stan Lee (Jack Kirby had stopped doing pencils at the end of the Sentinels arc). The Mimic has the ability to take on the powers of any super-human he comes near, and he quickly learns who the X-Men are by being around them. He battles Beast, and also detects the powers of Jean Grey, whom he follows back to the mansion. There, being near all the X-Men, he obtains all their powers, and tries to fight them all. However, he doesn't have the training the X-Men do, and is quickly defeated. Before they can put the finishing touches on, he kidnaps Jean and takes her to an abandoned mine, where he recounts his origin -- his powers result from a lab accident. But the X-Men arrive just as Mimic tries to make his powers permanent, and stop him. His machine backfires, destroying the mine, and the X-Men rescue him. The machine takes his powers away, rendering him normal once again. In his first foray into the X-Men scripting business, Roy Thomas pens a 2-parter (issues 20-21) featuring the return of Professor X's old enemy (from Year 1), "Lucifer." The story begins with the old enemies of the X-Men, Unus and the Blob, dressing up as them and pretending to be X-Men as they rob a bank -- with the goal of sullying the X-Men's already-tarnished (from the Sentinel affair) name. We learn that Lucifer planted the idea in their minds to impersonate the X-Men. However, Scott Summers, who has walked out on the team because of his dangerous eyes, and his belief that they prevent him ever professing his love for Jean Grey, happens onto the villains and battles them. The rest of the X-Men except for Marvel Girl show up to help. However, Lucifer quickly discovers that Professor X is onto him, and he fires off a "mento ray" that paralyzes him. Jean uses a mind amplifier to contact him, and Professor X mentally tells her the story of how he lost the use of his legs -- battling Lucifer the first time. As the X-Men return to the mansion, Lucifer tells his supreme leader via video conference that it is time to unleash the "dominus." The Dominus it turns out (in issue 21) is a machine controlled by robots that will allow Lucifer to conquer the earth. Lucifer claims that the machine is utterly indestructible and will defend itself against any attack. Lucifer captures the X-Men, but they escape and battle the robots. Professor X orders them not to attack the Dominus machine itself, and instead to avoid the robots. As the X-Men duck and deflect the robots' blasts, the Dominus machine reflects the energy back at them, destroying the robots. Without the robots, the Dominus cannot be operated. The supreme leader contacts Lucifer and tells him that he is finished. Lucifer and the Dominus are taken up into space, and the X-Men remain behind victorious. Issues 22-23 tell the story of a criminal mastermind named Count Nefaria, who runs a cartel called the Maggia. Nefaria employs several villains, including Scarecrow (not the Batman villain of course! ), Plant Man, the Eel, and others, to battle and capture the X-Men, using an illusion machine to trick them into thinking they are fighting themselves. Then he offers them the typical villain's ultimatum -- to join him in holding Washington, D.C. ransom, or suffer the consequences. Nefaria's goofy plan is to put an "impenetrable" force field around D.C., and then demand 100 million dollars in special gold notes, for setting it free. Not wanting D.C. to be destroyed, the X-Men agree to play along. They take the ransom money, only to be ambushed by the five villains, who have decided to double-cross Nefaria. Meanwhile, a mysterious masked man enters Nefaria's base by hypnotizing his goons, and shows the ability to operate the device creating the force field, thus defeating Nefaria's plan. Count Nefaria flees on a boat, with the briefcase full of gold notes. But the masked man is revealed to be Professor X, walking on mechanical leg enhancements, and the briefcase is just an illusion generated by Nefaria's own equipment. Issue 24 tells one of the goofiest X-Men stories of the entire series to date, as a mad scientist calling himself "the Locust" uses a special ray-gun to grow super-large insects and uses them to attack farming communities. The villain is actually an entomologist, who has invented a special insecticide. His plan is to produce giant insects to threaten society and then use his insecticide to save us, thereby becoming rich and famous. The plan itself is not bad (Syndrome's plot in The Incredibles was similar), but the whole idea of the X-Men battling giant mutated insects that were grown to a giant size from small larvae by a special growth ray is just silly. Add in the fact that the villain is wearing a giant "locust suit" that gives him special powers, including the ability, via his antennae, to control insect behavior, and this story is over the top on the corny meter. The X-Men defeat him when Marvel Girl uses her telekinesis to tie the antennae together, causing Locust to lose control and be attacked by his own creatures. In the end he "sees the light" and decides to turn himself in. Although I had read some of the Year 1 issues many years ago (my good friend +Stuart Johnson owned reprints of at least the first 6), I had never before read any of the year two stories. Therefore, this part of the series held some real surprises for me. Probably the biggest surprise, as I mention above, was how early (issue 14) the Sentinels and the anti-mutantism make their appearance in the Marvel Universe. I knew this was a long-running story back in the 1970s when I started reading X-Men, but I had not realized that Stan Lee and Jack Kirby had created it almost from the beginning. Although it was a fun read, I thought that the "anti mutant" hostility sprang up in a very unbelievably short period of time -- one anthropologist announces that mutants are evil and all of a sudden people are throwing rotten tomatoes at the X-Men any time they appear? Given how slow-moving some of the other plot elements (like Professor X's quest to one day get the use of his legs back) are, I find it particularly curious that Stan and Jack rushed this plot idea so radically -- especially given how integral it became to the X-Men. It almost seemed like they got together after issue 13, said, "let's make mutants hunted!" and that was the end of it. And so, I enjoyed the Sentinel story, and to someone familiar with the long-running anti-mutant theme in Marvel, it was no surprise... but I bet the rapidity of society's instant condemnation of mutants bewildered a lot of young readers back in the early 60s. Another, rather unpleasant, surprise for me was the scripting of Roy Thomas. I knew Stan had stopped writing X-Men by issue 20 (he stepped back to become editor of the Marvel line), so I wasn't shocked that Thomas started writing. Rather, what surprised me was what a dip in quality both the plotting and the scripting took from the very issue where Stan Lee stepped away. Published in the Silver Age as they were, I expect campy, corny plots, but Thomas' work is just completely over the top here.... it makes Stan Lee's writing look like Shakespeare. I ordinarily enjoy the heavy soliloquizing that was so common in this era of comics (and I miss it dearly in modern fare), but the dialogue Thomas wrote here was incredibly juvenile. This was a huge surprise to me because, in the 1970s, I had read and enjoyed many comics written by Roy Thomas, so I had expected the quality of the writing to go up, not down, once he took over for Stan Lee. Boy, was I mistaken. I particularly dislike the pattern Thomas fell into, of creating something "invulnerable to any force known to man or mutant" (the Dominus, or Nefaria's force field) and then coming up with a quick one-page way to easily and quickly defeat it, usually a page or two before the end of the story. It almost felt as if he had written himself into a corner, couldn't get out, ran out of pages, and just said, "aw screw it, let's have the machine defeat itself" or something. One thing I did enjoy about this year of the series, and it definitely contrasts with modern comics, was the incredibly snailish process of Scott and Jean's love for each other. For 24 issues now, the two have had feelings for each other, but neither is willing to speak the words out loud. Scott tries to avoid letting Jean know how he feels, because he does not think it's fair to be with someone as long as his eyes remain a threat. Jean, meanwhile, assumes Scott has no feelings for her, because he hides them so well, but continues to have an immense crush on him. As I read these comics I keep expecting the relationship to advance, but it only does so in the tiniest little increments. This really shows how much the writers, and readers, of Silver Age comics liked to savor sub-plots. Character interactions are drawn out over the long term, and this provides great momentum for the series as a whole. Rather than relying on multi-part story arcs to keep the readers involved, the writers of X-Men (whatever other flaws the series might have had) used character to keep readers hooked. If we like Scott and Jean, we will keep reading just to see where their relationship goes. Overall, X-Men's second year was similar to the first. There were some great stories, especially the Sentinel arc and the defeat of Juggernaut... and there were some overly corny ones, like the Count Nefaria plot. The writing quality definitely declined dramatically after Stan Lee left -- although how much is due to him or due to the departure of artist and co-plotter Jack Kirby (who left around the same time) is unclear. I'm hoping either Thomas "found his voice" in Year 3, or he got replaced in short order, though, because I don't know how many more Thomas-written issues I can take.